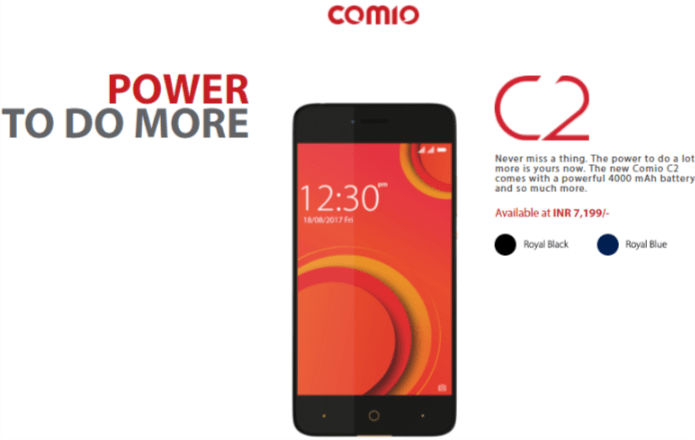 Comio India has unveiled a new budget smartphone, the Comio C2 in the country. It is the fourth member in the company's budget smartphone portfolio and is priced competitively at Rs 7,199. The new Comio C2 handset will come in Royal black and Royal Blue variants and will ship with free screen protection film and a scratch free back protection cover. It'll be sold offline via key retail stores in North and West India and online via the e-commerce platforms of Amazon, Snapdeal, Flipkart, ShopClues and Paytm. The new Comio C2 packs a 5-inch HD (720x1280 pixels) display with 5 finger support in its 144x71.6x9.9 mm form factor. Under the hood, there is the MediaTek Quad Core 1.3GHz 64-bit MTK6737 Chipset coupled with Mali T720 GPU and 2GB of DDR3 RAM. There is 16GB of onboard storage which can be further expanded to up to 128GB using a microSD card. In terms of optics, the rear of the Comio C2 houses an 8-megapixel primary camera with auto-focus and flash. On the flip side, there is also an 8-megapixel secondary snapper supported by flash and beautification mode for capturing selfies. Both the cameras have F2.0 aperture lens and allow 720p video recording. 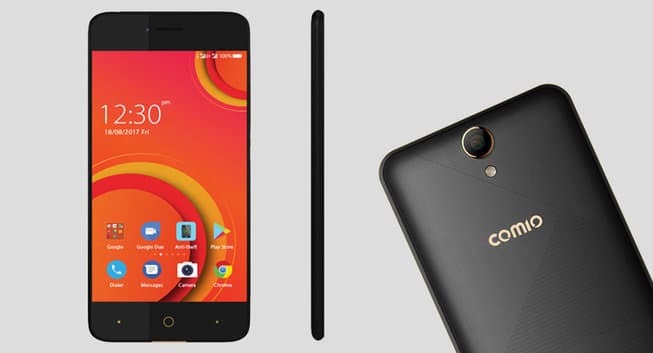 Connectivity options on the Comio C2 include dual SIM with 4G VoLTE/ViLTE, Bluetooth 4.0, GPS, Wi-Fi 802.11b/g/n, FM radio, micro USB and the 3.5mm audio jack. Onboard sensors include the standard Accelerometer, Proximity and the Ambient Light Sensor. The Comio C2 runs Google's Android 7.0 Nougat wrapped under the Comio UI and is powered by a decent 4000 mAh Li-Polymer battery which promises 500 hours of standby and 20 hours of talk time. Other interesting features preloaded on the new Comio C2 includes Anti-theft Security, Intruder Selfie, and antivirus. The anti-theft feature works by sending SIM-based alerts to the registered alternate mobile number if it detects any suspicious activity, while the intruder selfie is handy in case of any unauthorized person trying to unlock the device by breaking the pattern or PIN. The smartphone automatically uses the selfie camera to capture an image allowing the real owner to easily spot the miscreant. Additionally, to attract customers in the Indian market, Comio is offering free one-time screen replacement warranty within six months of purchase and an extra 100 days of manufacturer warranty over and above the standard one-year protection. Comio has also partnered with the Reliance Jio, which will entitle the Comio users to receive an additional 5GB of 4G data voucher with a recharge of Rs 309 or above, for four months.